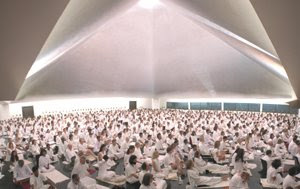 Every evening we meet at the magical Osho Auditorium for The Evening Meeting -- a wonderful meditation created by Osho. Everyone wears a white robe, is freshly showered, celebrating the day. Every evening Osho's video is played. What a feast! We get to hear gems of insights that brings clarity and light. Today I heard one such insight and I was thrilled. Felt like sharing it with all. he has forgotten other ways of communication. There are many other ways of communication. The idea that language is the only way of communication has made humanity very poor, very prosaic. Ah! Exactly what I was feeling like! Communicating without a language, this is what we have been ignoring all the time. And amazingly when there is a communication without any language, it reaches directly to the heart! From the heart of speaker to the heart of listener! Thank you very much for sharing this with us. I love to read your blog! Although I wish you had not written anything, but...perhaps that's me! ?